Jakarta, Indonesia — Jakarta Film Awards (JFA) just announced their lineups for this year. 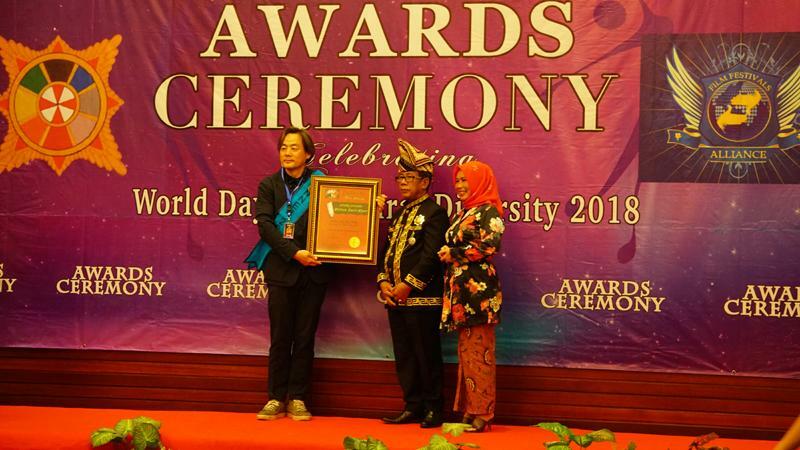 The international film festival held its Awards Ceremony at the Taman Mini Indonesia Indah, the Indonesian Cultural Park, celebrating the 43rd anniversary of the National Park. The Awards Ceremony is a blast with red carpets, and crowds flooded packed the place. Kings and queens of Indonesia, many ambassadors, artists, filmmakers, and cultural society attended the big event. Give Me the Sun directed by Ban ZhongYi, a documentary about seven aging Chinese women whose bodies and minds were irrevocably scarred by the unspeakable brutality they suffered during World War II, when they were often gang-raped for months until their families could ransom them. Some were lured into sexual slavery by locals working for the Japanese Army, who promised them work in factories or hospitals; others were simply abducted and enslaved in the nearest comfort stations. The American War, directed by an American veteran of the Iraq War, Dr. Daniel Bernardi, tells the story of the Vietnam War from the perspective of six Vietcong veterans: a soldier, an officer, an informant, a guerilla, a My Lai survivor and the leader of the Long Hair (all women) army. Using rarely seen North Vietnamese archival footage, animated illustrations and interviews set in homes, villages and prisons, The American War gives voice and character to Vietcong veterans. The Eve directed by Luca Machnich is a short film that tells a story about a young boy who dreams to meet the Santa Claus. This semi-horror film is chosen because the complexity of the mixed color made every frame of this film beautiful yet creepy. The Demilitarized Zone (DMZ) directed by Korean director Inchun Oh tells the story of the most dangerous zone in the world, which was established on July 27, 1953, when the Armistice Agreement was signed during the Korean War. This film stars Joo Min-ha who played as a female officer who tried to catch a jailbreaker in DMZ. Michael directed by Satrajit Sen is a Bengali film that revolves around a person working man who dreams to be a film director. Among the VVIP guests of the event are: the king and queen of Keraton Amarta Bumi, Sri Anglung Prabu Punta Djajanagara Cakrabumi Girinata and Kanjeng Ratu Dinar Retno Djenoli; King of Tallo, Makassar, Haji Andi Abdul Rauf Maro Daeng Marewa; Sultan and Queen of Indrapura Indra Oesman and Triliyanti; Prince of War of Indrapura, Ir. KPH Randi Indra Syahdan; Princesses from the Kingdom of Aceh Tamiang, Teuku Marini and Teuku Marina; Queen of Papua Barat, Petuanan Tanah Rata Koko Imeko; King of Samosir, King Chalid Robin Gultom; King of Gorontalo, Yohama; Prince Hari of Kutai; King of Gorontalo, Rudi Wahab; King of Luwun Timur, Saiful Daeng Marewa; King of Toba, Sorimangaja. Six Excellencies from six countries also attend this event. From Suriname, Ricardo Vanca; Rusia, Alexander Smirnov; Armenia, Lilit Sargsyan; Libya, Massoud Koshly; and from Saychelles. MaXiang from China also received special awards during the event.